Leopard 2A7V is a variant of modernization of Leopard 2A7 Main Battle Tanks (MBT), proposed to the Bundeswehr by Rheinmetall. The finishing of testing of the demonstration prototypes of Leopard 2A7V MBTs at the Bundeswehr training ground was reported in July 2017. The difference between this variant and Leopard 2A7, according to the manufacturer, is that, among other things, an auxiliary power unit with a power of 20 kW is installed, which, with the main engine switched off, provides operation of some units and systems, including an air conditioner and a fire control system. Also in it are applied thermal imagers of the third generation, the power of the guidance drives is increased, the cooled thermal imaging rear camera of the driver is installed. The modular protection allows to be adapt Leopard 2 A7V to different requirements. As in Leopard 2A7, this version of the MBT is equipped with a 120-mm L55A1 gun, so it can fire a new generation of armor-piercing ammunition, which form a higher pressure in the barrel channel. Also in Leopard 2A7V can be used the new programmable universal projectile DM11 from Rheinmetall. In September 2017, it was announced that Rheinmetall received an order for the upgrade of 104 Leopard 2 tanks to the Leopard 2 A7V standard. In combination with additional services, the cost of the modernization package is a total of 118 million euros. The first mass-upgraded tanks Leopard 2 A7V will start to arrive in the Bundesweeper from 2020. 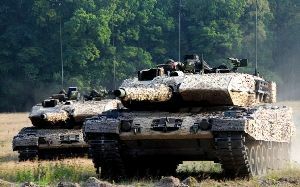 In accordance with this order, a total of 68 basic Leopard 2A4, 16 - Leopard 2A6 and 20 - Leopard 2A7 will be modernized.